My PAL light sixer which is just a few weeks away from being in my possession for 37 years. My favorite is the Atari Junior with the big rainbow followed by the Sears Heavy Sixer. Somedays I like one more than the other. Edited by adamchevy, Wed Oct 28, 2015 1:52 PM. A week ago I would've voted "4-switch woody" because it's what I grew up with and played the heck out of. However, I just acquired a Heavy Sixer and ohhhh myyyy is it nice. This isn't just a typical Atari with thick edges as I've been lead to believe all these years. The entire bottom case half is thick and curvy. In fact, the entire bottom case half is nothing like the bottom case halves of any of the following models. The plastic is not the hard brittle stuff but a kind of hard rubbery material. There's probably a name for it. Light Sixers and Four Switchers went with an angular style. You can really see it when looking at the console head-on. I had always heard that the Heavy Sixer's weight was attributed to RF shielding or whatever. That's wrong. It's from that super-thick case bottom. And that rubber grommet that the RF cord pokes though? Niiice! The whole thing oozes style and you can really see where Atari cut corners with later models. That said, I still love my 4-switch woody but my vote's gotta go with the Sunnyvale Heavy Sixer. By the way, are you a moderator? If so, then fine, you have the right to dictate how others post. If not, then it is generally considered rude to try to dictate how others post, especially when your reasoning is debatable. Yes I am the moderator for this forum and have now cleaned up this thread. I don't see a "Moderator" badge underneath your user icon. Shawn is the Moderator for the Poll of the Week threads/forums, as well as the Atariage secret moderator as well. Shhh... Don't tell too many people. I picked the sears model as my sears heavy sixer is the pride in my collection and it just feels so sturdy and well built. otherwise I think the vader 2600 looks very slick. 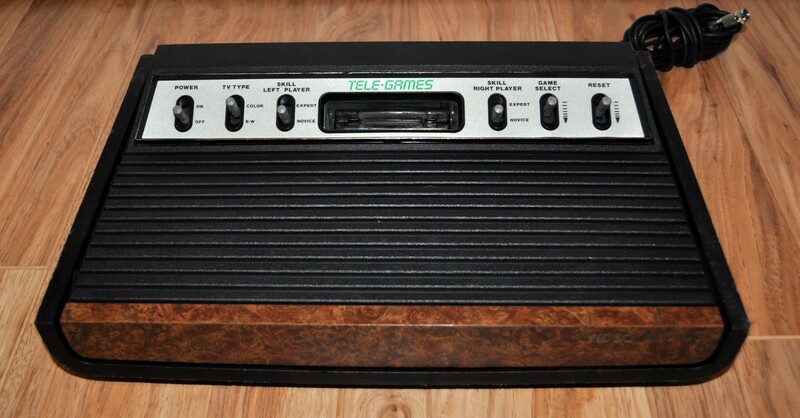 I just bought a Sears Tele-Games Heavy Sixer from someone that sold it in the marketplace yesterday. I have all the Atari branded 2600s, but wanted to get a Sears Heavy Sixer so bad. They are beautiful and sleek. Love the fake walnut grain veneer, silver cart slot bezel, the digital font "Tele-Games", it will sit right next to my Atari Heavy Sixer on the shelf display. Here is the system. Thats a nice one! looks like new! Vader always looked the coolest to me. Heavy/Light Sixers. The Vader model is also really nice. I'm not a big fan of any of the Sears models - I find the metal faceplate and more mottled look of the wood grain to be kind of tacky. Heh... no matter which I choose, I can't really vote! First I'd like to say Six Switcher, heavy or light doesn't matter to me, I just want the the difficulty switches easily accesible and the woodgrain finish. I prefer the model with the small rainbow over the large. But that HUGE rainbow just detracts from the stainless steel strip sooo much. Gotta be the small rainbow. Edited by Torr, Tue Jan 12, 2016 9:11 PM. Tacky? How dare you. They are beautiful...beautiful I say! heavy sixer and light sixer, they are the top of the top. The Sears consoles went through every revision except for the VAII, (the 2800), the Dark Lord's approved model, and the Jr. There are Heavy and Light sixers, (I remember 'em in my local Game Store). I'll always be partial to the 4-switcher. It's what I grew up with. I think the 4-switch woody is the most common variant, at least. I was a Sears Telegames kid. Though I have not played on that system in years. My heavy 6'er (which is rarely played). And the Intellivision VCS adaptor (Which I tend to play more since the above two are not as accessable.). Heavy sixer for me. I always tend to favor original consoles. I prefer the nes toaster to the toploader, the model 1 genesis, and the original fat version of every PlayStation console compared to the slim models.